Have you been looking for an affordable way to upgrade your patio or outdoor surface? If so, you should consider the many different concrete stamping options we offer at Concrete Contractors Fort Smith. Stamping is achieved the same way as any normal concrete surface is created, but after it is poured it is stamped with patterning to resemble other materials such as bricks, tiles, stones and more. 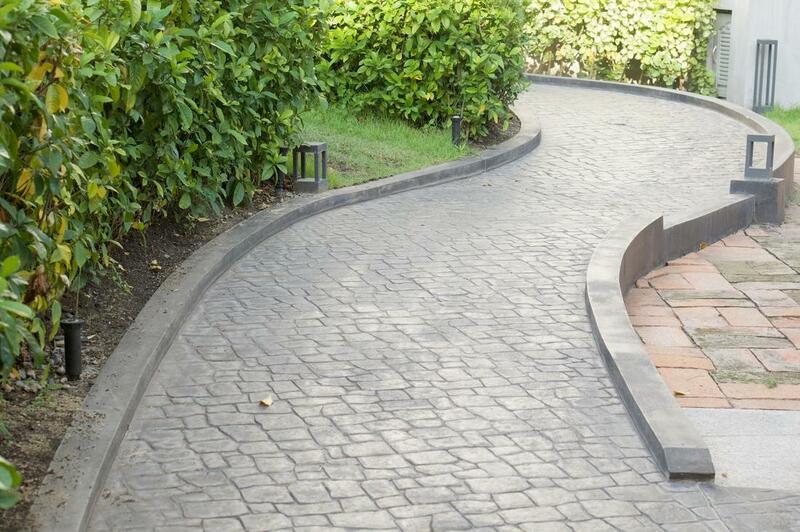 Stamped concrete can offer you a wide variety of pattern and color options, excellent longevity, quick installation, low-maintenance upkeep, and affordability. The concrete can be colored to match the exterior or your home or any other features you would like to highlight or match. It can be quick to install because unlike other things like concrete pavers it can be poured and stamped in minimal time. As far as maintenance goes, simple sweeping and occasional pressure washing will keep the surface looking new for a long time. Many people that choose to install stamped concrete do so in hopes of creating an elegant and impressive look without breaking the bank. If you walk around most downtown metro areas you will see all sorts of examples of stamped and stained concrete patterning, and they could easily be achieved in your home! If you are able to take a step back and see the big picture of how a stamped surface may add to your landscape you will see that the possibilities are endless. Anyone that visits your home will be in awe of how great your outdoor flooring compliments the interior design of your home and will be a perfect place to relax with your family and friends. A pool deck is boring and uninteresting but can be completely transformed in ways you would be shocked to see. We've talked to so many homeowners that at first considered taking on stamping job on their own. Some concrete jobs are very easy to accomplish by yourself but we always suggest working with a professional when it comes to creating high function and complexity stamping patterns. Working with concrete can be quick but also has the potential to produce a huge mess if in the hands of someone inexperienced. You also wouldn't want to end up with a surface that isn't perfectly level! Certain steps must be taken when preparing and finishing, and our contractors have the skills to make sure your patio is perfect! Concrete Contractors Fort Smith is the trusted name in the area that you can trust to get the job done. Our licensed and insured contractors will make it possible for you to have the stamped concrete that you have always dreamed up for an affordable price! Feel free to give us a call with any questions you may have about how we work, we would love to put your mind at ease at how easy and convenient it can be to hire us for our concrete services! We hope to hear from you soon.